Featuring Philip Francis Nowlan’s “The Airlords of Han,” sequel to his “Armageddon 2419 A.D.” in the August 1928 Amazing. 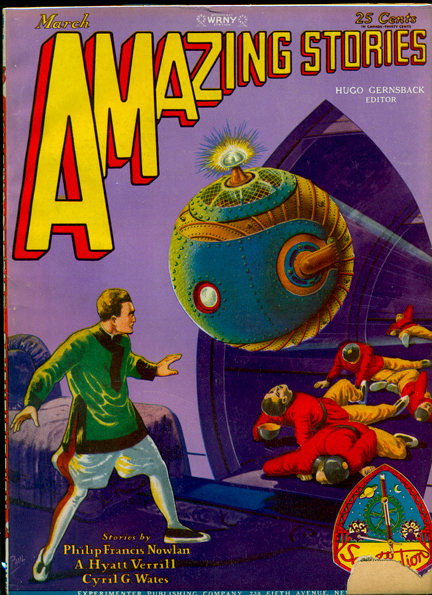 This short novel, illustrated on the front cover by Frank R. Paul, concludes the adventures of Anthony Rogers, later known in comics, movies, radio dramas and TV shows as Buck Rogers. Condition: Without the chip at the bottom right corner of the front cover (see scan), this would easily be a Very Fine copy. It’s stunning in every respect. Even with the chip it displays well. Originally belonged to famous SF collector Gerry de la Ree.